When people retire, many start with some hobby. 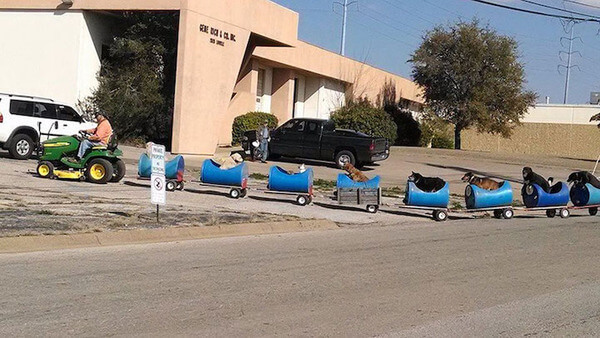 Usually, it’s gardening or some arts and crafts, but Eugene Bostick had a really unique idea: he became a stray dogs train driver. Actually, his hobby is much more than that and it’s very humane. “We live down on a dead-end street, where me and my brother have a horse barn. People sometimes come by and dump dogs out here, leaving them to starve. So, we started feeding them, letting them in, taking them to the vet to get them spayed and neutered. We made a place for them to live,” said this 80-year-old caring man for The Dodo. 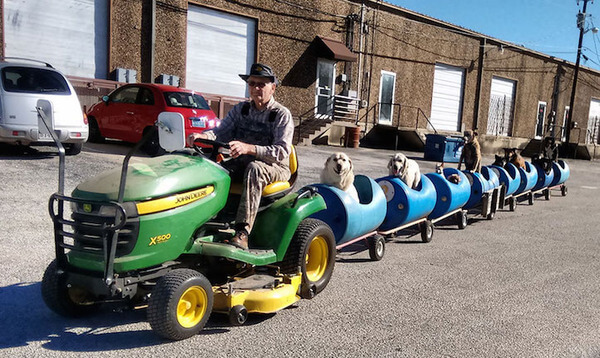 In his care for stray dogs, recently, he went one step further from providing them a place for living, food and vet care; he invented an uplifting dog train. “I [saw] this guy with a tractor who attached these carts to pull rocks. 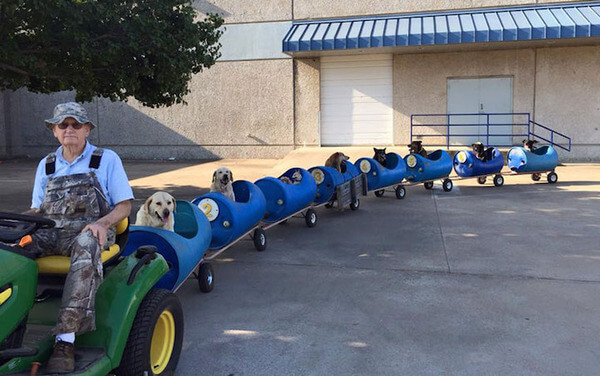 I thought, ‘Dang, that would do for a dog train’,” he said. “I’m a pretty good welder, so I took these plastic barrels with holes cut in them, and put wheels under them and tied them together,” and so dogs got their favourite vehicle which made them very happy. Few times a week Bostick takes his strays for a ride. “Whenever they hear me hooking the tractor up to it, man, they get so excited.They all come running and jump in on their own. They’re ready to go,” Bostic explained their excitement about this unique train made of plastic barrels.